Always wash your Hands before washing your Face! As I was chatting with my best friend/beauty guru about what new items to add to my spring grocery list, I mentioned I was writing an article on shrinking pores and asked her for advice. Neither of us had ever had a huge problem with our pores (don’t hate us… I make up for it in pimples and uneven skin-tone), so we didn’t know exactly what it took to shallow-out those evil craters. I was getting fed up with researching because I don’t normally like talking about treatments I haven’t tried myself, so like any normal distraction-driven chick that lives next to Trader Joe’s would do, I told her I was going grocery shopping instead. “Elana, stop pore-crastinating!” she exclaimed. Bingo! Brilliant!That’s it. Exactly what I needed to hear! That’s the trick to shrinking pores…get to work, NOW! The longer you wait to take care of them, the more stretched out and visible they become. So if you’re like me and spend your extra money on lobster ravioli and truffle salt, I found some super inexpensive treatments to give your face that flawless, airbrushed look… huge-hole-free. Check it out. Pores get stretched when they are filled with junk . Just like we clean out our closets to make room for new clothes, we have to do the same with our skin. The cheapest and easiest way to do this is an at-home steam bath. Estheticians use this method on their clients while giving professional facials so you will feel like you are at a spa without draining your pockets. The steam brings heat and moisture to your skin to open your pores and clear them of bacteria,toxins, dirt and dead skin. All you need is a stove, a pot, water and a towel. If you desire, essential oils, flower petals and/or herbs can be added to stimulate your senses . Bring your pot of water to a boil. If you are using fresh herbs or flower petals, add them in and lower your heat to a light simmer. Leave it on the stove for a few minutes then remove it off the element and place it on a comfortable enough platform to perform the steam bath. A low counter or table will do.Don’t forget to put the pot on a heat-safe rack so you don’t ruin your table. If you are using essential oils, add a few drops into the water once it is off the stove. Drape a towel over your head and lean your face over the pot. Inhale the delicious scent and nourish your skin for around 5 minutes or until the steam clears. Finish off with a cool rinse. Do this once a week and keep it consistent! When your skin produces too much oil, your pores get clogged . 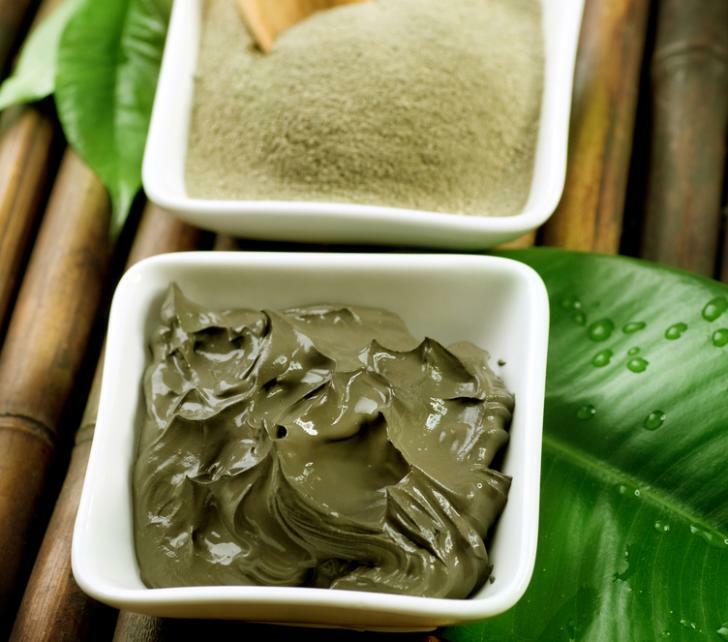 Clay masks are an excellent way to draw out the unneeded oils and get your skin back to a pore-free-appearing complexion. They are inexpensive and can be found at any drugstore or supermarket. Pack a thick layer on a cleansed face and hide behind the front door to scare whoever walks in to the house next. Just kidding. Keep the mask on until it hardens then rinse it off with lukewarm water. Your skin will feel nice and tight! This will clean out any clogging and create a clear passage for natural oils to flow freely through your pores. You can perform this treatment 1-2 times a week. Once again,consistency is key! My favorite part of my skincare regimen is exfoliating. I love the feeling of scrubbing the day off my face. It might just be psychological because I can really feel the beads rubbing on my skin, but face scrubs always make my skin feel extra clean. They are especially good for getting into those large pores. As we discussed already, build up can cause pores to stretch and appear larger than we wish them to be, so get yourself an exfoliation gel or make an all natural one for yourself! Create a savory scrub out of lemon and sea salt or a sweet escape with honey and brown sugar.Best part is you get to lick away the leftovers! And if you use a gentle enough exfoliant, you can perform this daily. Uhh..feels so good! What you DON’T do to your skin is just as important as what you DO to it. With that being said, stay away from the following to keep your pores tight, tiny and out of site. Firstly, sun damage weakens the elasticity of your skin and exaggerates those gaping holes in your face. If you can’t stay out of the sun(guilty), use an oil free sunscreen every morning before you walk outside. Second, using oily products is like adding fuel to the fire. If you have oily skin, throw out those greasy, creamy moisturizers and op for something less emollient. But on the contrary,using products with too many irritants and drying agents can cause your skin to produce even more oil. Read the ingredients in your products and ask a professional for the right choices for your specific skin type. Lastly, I know, I know… you’re tired and/or had one too many Cosmopolitans and can barely take your stilettos off but DO NOT, I repeat, DO NOT fall asleep with a face full of makeup. If you want clear skin, you have to push yourself.Like my best friend, stop Pore-Crastinating! Shrunken pores skin begins with you. Make the move and soon enough you will reap the rewards of your hard work!